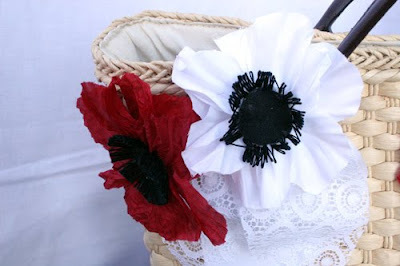 Last week we learned how to make a poppy flower pin from scratch using bits of silk or cotton. Naturally, you can wear this as a pin. 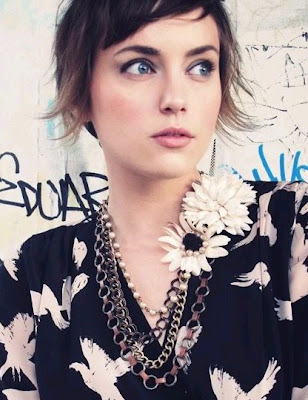 Or, you can do as Kelly Framel, aka The Glamourai, did and pin your flower to a chain. 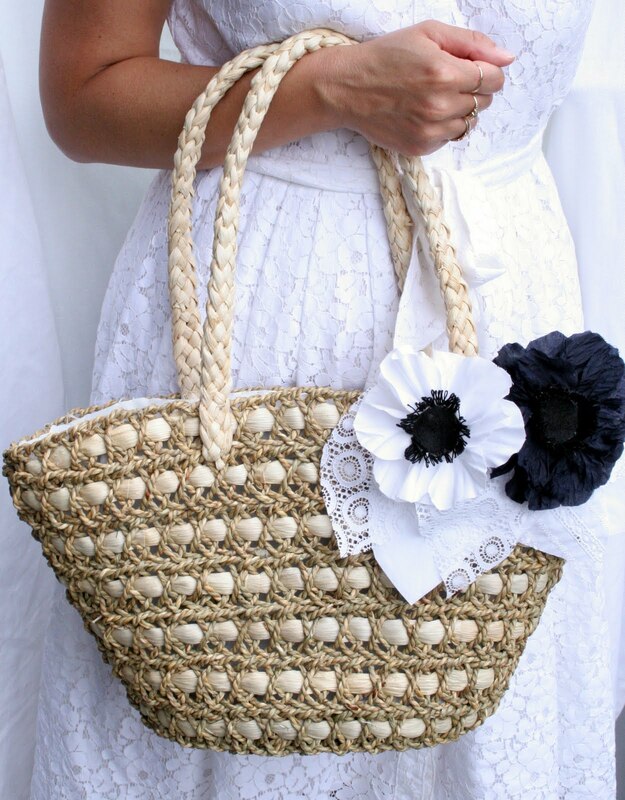 Or you can incorporate your hard work into Chanel-inspired clogs and bags. 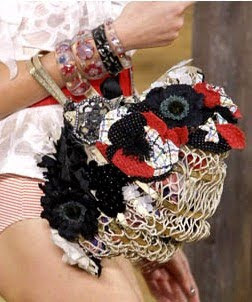 Below is the inspiration - Chanel's Spring/Summer 2010 collection. 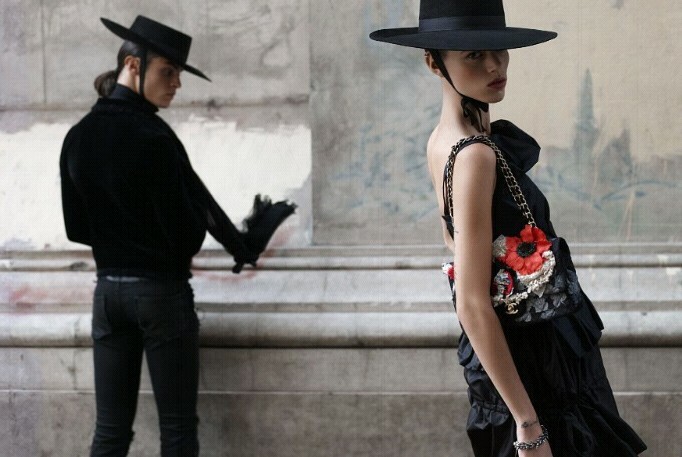 I'm not sure what, if anything, the model is wearing on her bottom half, but focus on the bag and shoes. 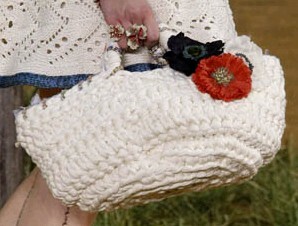 Chanel has lots of basket-y looking bags this year, including the infamous picnic basket, below. Of course, we mustn't forget the Claudia Schiffer bag that started this whole thing. To embellish your own a la Payless or thrift store clogs, you can simply pin the brooch right to the clog. (Clogs are back, by the way. Walk carefully.) If your clogs lack a strap, you can attach your pin to a shoe clip with a bit of velcro. 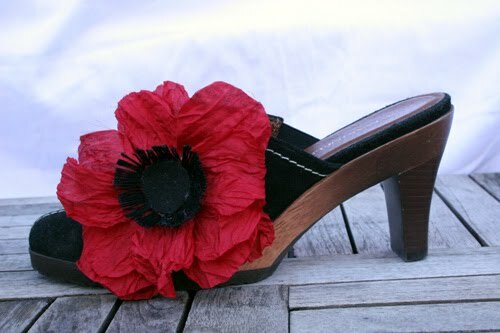 If you lack the toe-curling skills required to wear clogs, poppies will work with mules, too. All it requires is the guts to wear them. For the bag, keep an eye out at your friendly local thrift stores for straw totes or black Chanel knock-off bags. 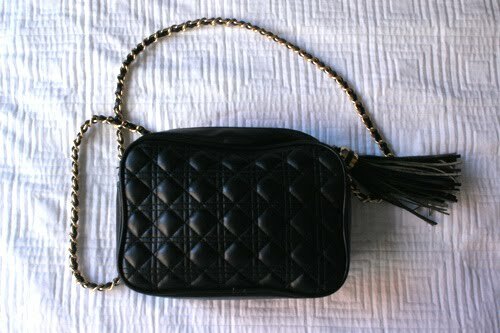 For the black bag, look for the iconic Chanel shoulder strap - a gold chain with a strip of leather woven through it. 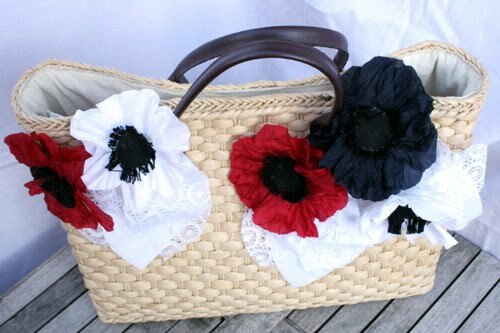 Make the lace embellishment by hot gluing in the following order - felt on the botton, next the plastic, next some white fabric. Top it off with two or three lace leaves. 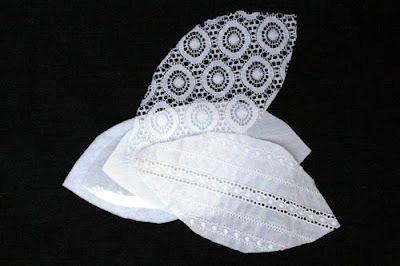 Wrinkle and pucker the lace as you glue it down. Flip the lace embellishment over and glue a pin back to the back side. 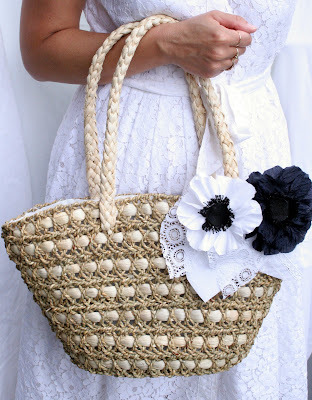 Then attach to your chosen bag. 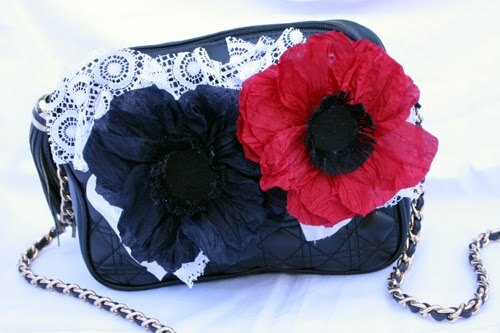 I tried a couple of different bags and combinations of lace and flowers. The first one seemed too much. The second one seemed too small. 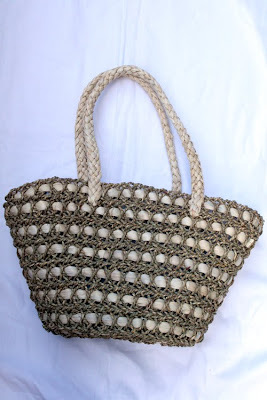 Then I came across a much cuter straw bag at a thrift store and started all over again. 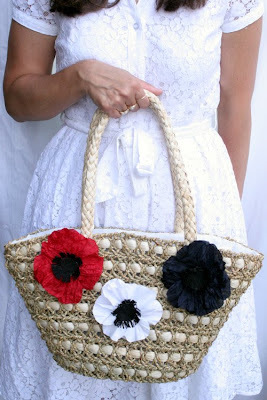 Here's the cute bag with flowers sans lace. In the end, a few flowers and a little lace seemed to work best. This is a bag I would actually wear. So cute - they totally transorm the accessories. These are some of the cutest things you've made to date. 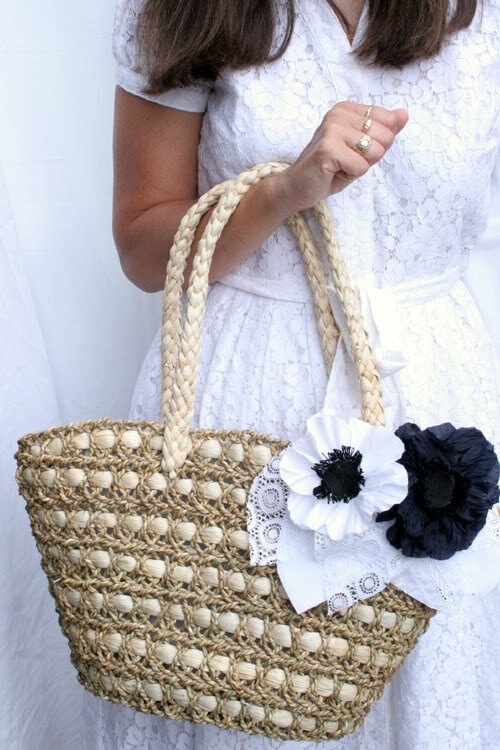 I love the last pic - the dress and the bag - what a great summer look. 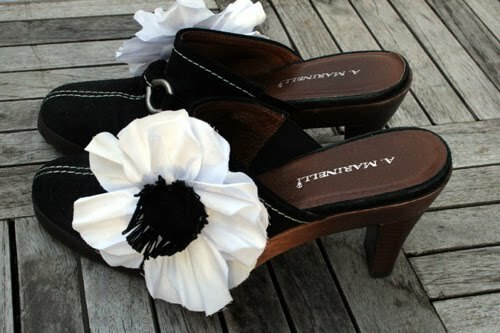 For years and years I've been attaching flowers to my shoes, and now, at last, History Has Proven Me Right. 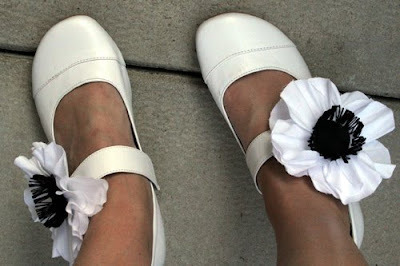 Those white mules with white poppies are perfect. Something that I never would have thought of, but it works so well, especially with the fetching white dress. and i can't stop gawking at that model's lower half! 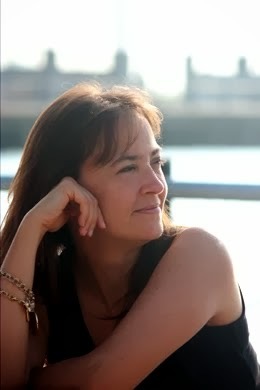 what the hell!